Do on adoption day take your new family member directly home. Do have a comfortable space set-aside with/without a crate where your new companion will feel he/she is safe and can rest. Do let your new family member feel safe and comfortable with you, your family, and new home before you introduce him/her to other new people, pets, etc. DO KEEP IN MIND that your new family member may exhibit different behaviors for you than those seen in his/her foster home. Do keep in mind Danes and stairs can be an issue. 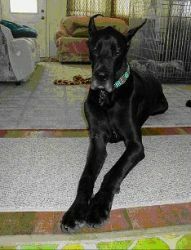 Some Danes may need to learn to go up and down stairs, some may need to get used to your particular set of stairs. of space. This will lessen the stress level for the dog and possibly prevent a bite due to a lack of human-canine communication. DON’T go straight home with your new family member. You need to walk your dog before you bring it home to burn off some of that energy and establish yourself as the leader. You should make your dog heel on the lead without pulling and go through all entrances and exits such as doorways and gates before the dog. In a dog’s mind, the leader leads the way. DON’T unsnap the lead and allow the dog to investigate your home on his own. Walk him around the house on a leash and be sure you continue to go through doorways first. This continues to show your leadership. DON’T pet the dog if he is excited, scared, nervous, anxious, nor when he is showing signs of dominance by demanding your attention. You would be rewarding fearful ro dominant behavior. 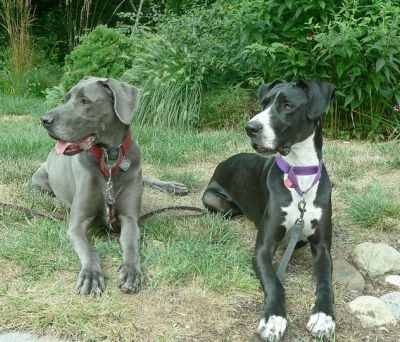 Giving your new family member the time needed to acclimate to his/her new surroundings is crucial to the future relationship between you and your Dane. 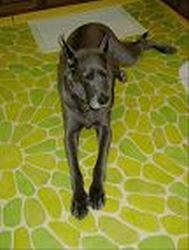 We suggest gathering information on the routine your Dane was accustomed to in his/her foster home. 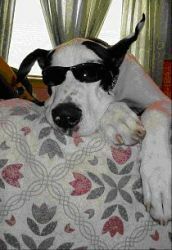 Knowing some key facts about your Dane’s behavior, moods, habits, etc. in his/her foster home can make the transition into the new home easier.